He is 17 inches long with jointed limbs. His head is not jointed. I believe his original eyes were glass but I cannot recall the color. He already had one of them replaced by a button when my dad passed it down to me. His claws and nose where stiched on. He has cardboard in his paws. I am unsure of what kind of stuffing is use, but he has a firm feel to him. He seems to have a seam that goes down his belly. From the information that I found on this website I suspect he maybe a Chiltern. 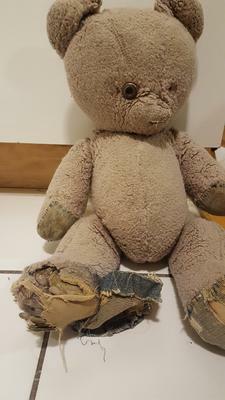 Only thing is that his limbs are shorter than what I have seen in pictures for that type of bear. 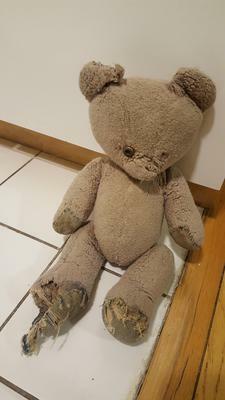 I want to send him to a Teddy hospital to be restored, but I wanted to know more details about him before I do that, so any help would be much appreciated.